The government's single-window body to clear foreign investment proposals, the Foreign Investment Promotion Board on Tuesday cleared Swedish furniture major IKEA's Rs 10,500-crore project, the largest foreign direct investment in single-brand retail so far. Moody's stripped France of its prized triple-A badge on Monday, cutting the sovereign credit rating on Europe's No. 2 economy by one notch to Aa1 from Aaa, citing an uncertain fiscal outlook and deteriorating economy. France said it would respond to Moody's credit downgrade by pushing ahead with economic reforms but complained the ratings agency had overlooked efforts already taken to revamp the eurozone's second largest economy. Japan will give a fresh loan of about US $22.6 billion for the second phase of the dedicated freight corridor and an infrastructure project in south India, Prime Minister Yoshihiko Noda told his Indian counterpart Manmohan Singh on Tuesday as they met here, making up for an opportunity lost a few days ago. Diageo Plc will launch a mandatory share tender offer to buy up to 26 per cent additional stake in United Spirits Ltd (USL) from public shareholders on January 7, the manager to the offer said in a notice to the Bombay Stock Exchange. Domestic air passenger traffic gained some momentum in October due to festive season as it recorded a jump of 537,000 and stood at 4,555,000 against 4,018,000 passengers in September. Eyeing better premium growth in the second half of current fiscal, leading private sector insurer Reliance Life expects to beat the estimate of an overall 10% industry growth in the entire 2012-13 financial year. 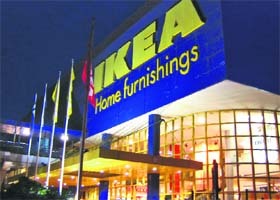 The FIPB has approved the proposal of IKEA, Economic Affairs secretary Arvind Mayaram said after the board meeting here. Leiden, Netherlands headquartered IKEA Group, which manufactures and sells home and office furnishing products, proposes to invest in single brand retail trading in India through a 100 per cent subsidiary. IKEA's proposal to set up 25 retail stores in India has already been scrutinized by the department of industrial policy & promotion in the commerce & industry ministry. The proposal will now have to be cleared by the Cabinet Committee on Economic Affairs (CCEA) as the FIPB can clear investment applications worth up to Rs 1,200 crore only. IKEA's would be the largest investment in the single- brand retailing ever since the government has allowed foreign investment in this sector in January. With the government relaxing the mandatory 30 per cent sourcing clause in September, IKEA which had earlier expressed concerns over the issues had put in its final application earlier this month. The downgrade, which follows a cut by Standard & Poor's in January, was widely expected but is still a blow to Socialist President Francois Hollande as he strives to convince the world he can fix France's public finances and stalled economy. Moody's said it was keeping a negative outlook on France due to structural challenges and a "sustained loss of competitiveness" in the country, where business leaders blame high labour charges for flagging exports. "The first driver underlying Moody's one-notch downgrade of France's sovereign rating is the risk to economic growth, and therefore to the government's finances, posed by the country's persistent structural economic challenges," Moody's said. "These include the rigidities in labour and services markets, and low levels of innovation, which continue to drive France's gradual but sustained loss of competitiveness and the gradual erosion of its export-oriented industrial base." 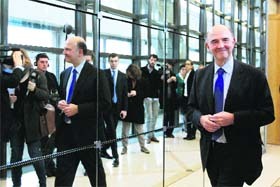 Finance Minister Pierre Moscovici told Reuters the downgrade was a motivation for the 6-month-old Socialist government to pursue reforms, but he noted that even after the S&P downgrade French debt has enjoyed record low yields. He also said the government was committed to meeting its target of cutting the public debt to 3% of economic output next year from an estimated 4.5% this year. The euro slid against the US dollar after the downgrade, by 0.30% from nearly a 2-week high to $1.2770, even though analysts said the downgrade was largely factored into bond markets. The S&P downgrade had little impact on French yields, which have been trading at record lows of just over 2% in recent weeks despite the concern about France's sickly economy. France lost its prized triple-A badge from the Standard & Poor's in January and so Monday's move by Moody's was not surprising but it underlined doubts about Socialist President Francois Hollande's ability to fix France's public finances. The downgrade also highlighted the divergence with the top-rated regional powerhouse Germany whose finance minister called it a "small warning" to its most important eurozone partner. Singh, while welcoming the announcement of loan, emphasized to Noda that India's priority was investments by Japanese companies in infrastructure projects like Delhi Metro Rail, which was a "fine example" other cities want to emulate. The two leaders were to meet in Tokyo on November 16 during Singh's scheduled three-day visit beginning November 15 for annual Summit. However, the visit was cancelled just a day ahead in view of sudden political developments in Japan with Noda deciding to announce elections. During the meeting today on the sidelines of the East Asia summit, Noda expressed happiness at being able to meet Singh to underline the close partnership between the two countries, sources said. He told Singh that he wanted to discuss the next steps in the relationship since they could not meet in Tokyo for the annual summit due to domestic developments in Japan, they said. Noda told Singh Japan would be announcing the second round of loans under Overseas Development Assistance (ODA) for the second phase of the dedicated freight corridor and a third infrastructural project in south India, where Japanese companies have a good presence, the sources said. The fresh loan amount is expected to be 184 billion yen (approximately $22 billion). Earlier this month, UK-based Diageo, the world’s largest producer of spirits, agreed to buy a majority stake in United Spirits, controlled by businessman Vijay Mallya, for $2.1 billion, fuelling a push by the world's biggest spirits group into fast-growing markets. The tender offer, which is part of the two-tranche deal that will give Diageo a 53.4 per cent stake in India's largest spirits company, will close on January 18, JM Financial said in a notice to the exchange on Tuesday. Shares in United Spirits ended up 0.6% at Rs 1,762, higher than Diageo's offer of Rs 1,440 a share to minority shareholders. The sharp jump in the stock has clouded the outcome of the tendering process, analysts said. However, as compared to last year, the sector on the whole registered a negative growth of 2.47%. Data released by the civil aviation ministry on Tuesday shows the number of passengers carried by domestic airlines going down to 48,394,000 between January-October 2012 as against 49,619,000 in the same period in the previous year. Experts say the reason for the decline in numbers could be the grounding of Kingfisher Airlines. “November figures will be higher,” they said. As far as October figures go, the low-cost private carrier IndiGo continued its dream run at the top of the ladder with 1,266,000 passengers while beleaguered national carrier Air India inched closer to gaining lost position. With 949,000 passengers the latter is no. 2 — ahead of the full-cost Jet Airways (824,000) and its LCC arm Jetlite (300,000). Incidentally, if individual figures are considered then the low-cost carrier SpiceJet also carried more passengers (869,000) than Jet Airways. According to ministry officials, domestic passenger data for the past six months shows a consistent rise in the market share of Air India. It has risen from 16.2% in May to 20.8% in October. “As compared to October 2011, the market share of Air India has shown considerable improvement rising from 16.6% to 20.8%,” they say. Further, the airline carried 949,000 passengers in October 2012 as compared to 898,000 passengers carried in October 2011. The passenger load factor of Air India improved to 74.7% in October from 64.7% in July. Ministry officials said Civil Aviation Minister Ajit Singh had asked Air India to further improve passenger load factor and ontime performance. The company is expecting its expanded distribution network and new customer-centric initiatives to help it achieve double-digit overall business growth during the current fiscal, Reliance Life Insurance president & ED Malay Ghosh said. “Notwithstanding a challenging economic environment, we’re confident of achieving double-digit growth in our overall business by the current fiscal. 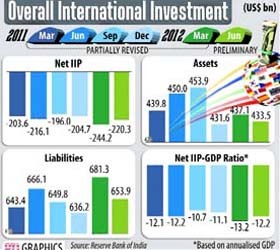 We expect higher growth in Q3 and Q4 and are hopeful of ending 2012-13 on a positive growth note,” he added. Reliance Life, part of Anil Ambani-led Reliance Group's financial services arm Reliance Capital, is targeting a total premium income of Rs 6,100 crore in FY13. Honda Motor is gearing up to launch its first diesel model, the Amaze, in India by next fiscal. The entry level sedan qualifies for the excise duty benefit enjoyed by small cars and will directly take on Maruti Suzuki's Swift DZire, the current undisputed segment leader. KocharTech, a wireless data services firm that is the data service backbone of top 5 global telcos, bagged the prestigious Aegis Graham Bell award for the second year in a row, making it one of the most innovative end-to-end telecom solution provider in Mobile Device Management & Testing Solutions in India.